Greek sunshine in historical surroundings with Club Med state of the art facilities gives Club Med Gregolimano all the ingredients for the perfect beach holiday. If you ever wondered how a modern Greek paradise might look, wonder no more. The modern architecture of Club Med Gregolimano rises triumphantly from the ancient ground like a Mecca for sports enthusiasts, located fittingly in the original home of the Olympics. 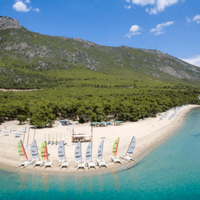 Here you can make use of the professional sports tuition, take the private access path to the white sands of the beach below, or plan an excursion to nearby Athens, Delphi or Meteora. There’s fun for all the family to be had, as well as romantic spots for a couple to enjoy. Sitting on one of the oversize sofas of The Aphrodite bar, with a glass of wine in your hand, you can enjoy chatting with friends and family. The dancing begins a little later. For a view of the bay, pool and stars above, why not head out to the terrace. You’ll certainly eat well at Club Med Gregolimano. Choose from the hotel-located The Panorama bar and restaurant, enjoy an international buffet-style meal on the terrace of The Pleiades, or opt for Mediterranean specialities in The Acropole. Booking may be required. 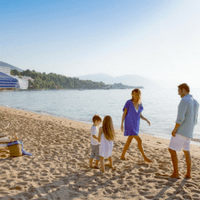 The accommodation at Club Med Gregolimano is split into bungalow and hotel rooms, similar to Club Med Kamarina. If you choose a bungalow, you’ll be located in the pine forest, in view of the sea, or on the beach. The hotels; The Parthenon, The Acropole and The Pirée have club or deluxe rooms. Some of them have a balcony too. For something a little more different, you can also opt for the Olympe club rooms, which are in a flower-filled area of reconstructed shady Greek streets on the resort. The kid’s club here is suitable for 4-10 year olds and offers tennis, football, waterskiing and circus skills coaching. There’s a playground on site, a baby corner in the restaurants and a babysitting service. Your children will thoroughly enjoy Gregolimano. All the equipment and tuition you need to enjoy the sporting and leisure facilities available at Gregolimano will be provided. 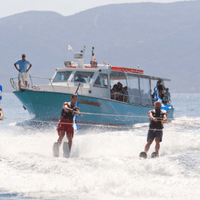 Choose from archery, learning the trapeze, tennis, waterskiing, wakeboarding and snorkelling among other things. It’s also entirely possible to spend your days lazing beside the pool, on the beach, or exploring the local countryside too! 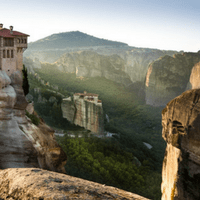 There’s plenty of famous ancient and medieval ruins to discover here, Greece is home to one of the first and most advanced ancient civilisations. Explore the background of local culture by visiting features from the myths or, should you wish to look into modern Greece, why not head for cosmopolitan beach resort, Aedipsos, just 25km up the coast. The picturesque ports of Limni and Sainte-Georges are also well worth a look.